The older we get, the greater our likelihood of dying. Or at least that’s what we thought. New research suggests mortality rates level off after we turn 105, and that no upper limit exists for the human lifespan. It’s an extraordinary conclusion — one that’s not going over very well with other ageing researchers. Once we enter into adulthood, our chance of dying doubles every eight years or so. But as Gompertz himself admitted, there simply isn’t enough data to prove that this trend holds true for the oldest of the old. Research published over the last 10 years, however, continues to affirm Gompertz’s model, including a 2017 study which showed that supercentenarians — people who live 110 years or more — still experience accelerated mortality rates over time. In recent years, however, some scientists have started to question the Gompertzian paradigm. A controversy has emerged that suggests mortality plateaus—in which death rates slow down and even grind to halt — exist for both humans and animals beyond a certain age. There’s now an active debate among ageing experts as to whether mortality rates continue to accelerate and/or rise exponentially into extreme age, or if they eventually plateau. 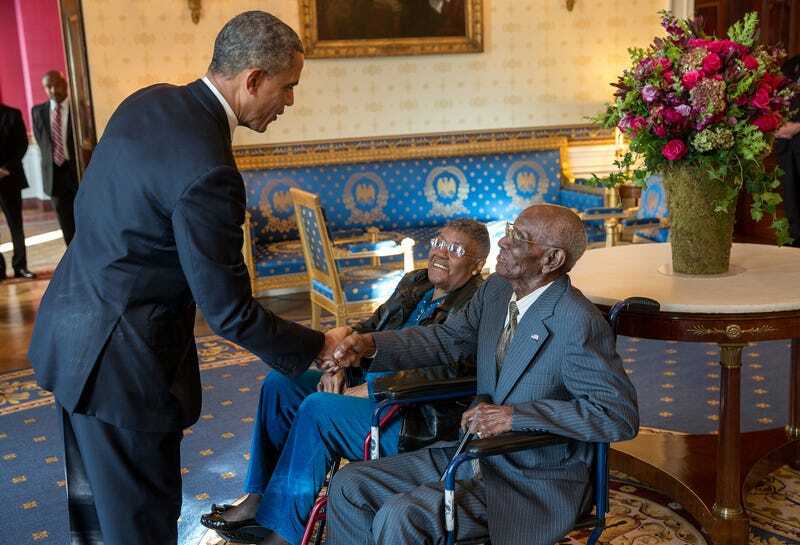 A photo from 2013 showing President Barack Obama meeting with Richard A. Overton. At the time, Overton was 107 years old. Today, he’s 112, and the oldest living man in the United States. A fundamental problem in ageing research is the extreme dearth of data. Only a handful of people live beyond the age of 105, and even fewer live beyond 110. For the new study, Barbi and her colleagues sought to overcome this limitation by taking a look at data collected by the Italian National Institute of Statistics (ISTAT). This unique dataset contains recently collected and validated information about individual survival rates of all Italian residents aged 105 and older from January 1, 2009 to December 31, 2015. The researchers used this data to create their own unique database of super-old people, and to produce estimates of mortality rates at extreme ages. 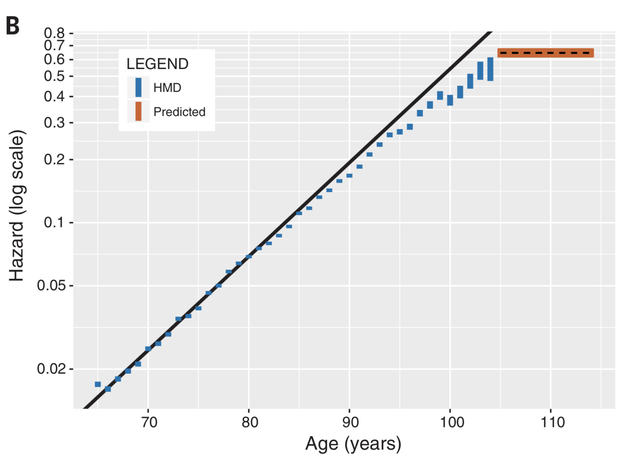 Graph showing chances of death (hazard) by age (years), with the plateau (shown in orange) after age of 105. The oldest known person to have ever lived died at age 122, but the reason we haven’t seen anyone live to 140, or 200, or beyond, is that a 60 percent chance of dying each year all but guarantees our eventual demise — at least, according to this paper. Brandon Milholland, an ageing researcher in the Department of Genetics at Albert Einstein College of Medicine who wasn’t involved with the new study, said the new paper is interesting, but he believes it’s only a small piece of a much larger puzzle. Milholland said a levelling off is understandable, but that doesn’t mean it has to remain flat. S. Jay Olshansky, a professor in the School of Public Health at the University of Illinois at Chicago, also has serious misgivings about the new paper — though he said the authors did an excellent job of creating a new set of data for researchers to evaluate. As far as Olshansky is concerned, these findings should have no bearing on how we study ageing and develop therapeutic interventions. Instead, he said scientists should try to figure out why people under the age of 100 are dying, and find ways to slow down their ageing. “I’m less interested in the tails of the distribution — except to figure out what’s so unique about them — I’m much more interested in the rest of humanity that won’t live that long,” he said.